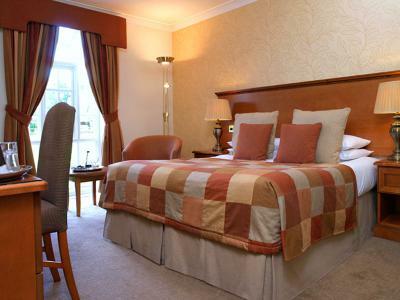 The Bridge Hotel and Spa, Wetherby, is located in a delightful country setting between Leeds and York, just 10 miles from the spa town of Harrogate and only a 5-minute drive from junction 46 of the A1(M). 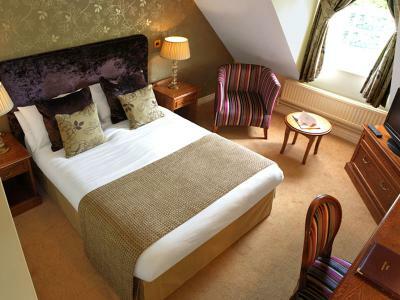 The Bridge Hotel is well placed for visiting the North Yorkshire Moors, Harewood House, Newby Hall and Fountains Abbey. A popular coaching inn for travellers crossing the River Nidd during the 1800s, today guests can enjoy the unique character and charm of the Bridge Hotel and Spa. The oak-panelled Byron Bar dates back 250 years and offers an intimate space to savour a quiet drink beside the original inglenook fireplace. An authentic taste of local Yorkshire produce can be enjoyed in the Courtyard Restaurant, where high ceilings and oak beams give a flavour of the Bridge Hotel’s heritage. Secreted away in the courtyard at the Bridge Hotel, the Spa’s thermal suite provides a tranquil haven of relaxation: Inside, let the vapour from the applewood sauna or the eucalyptus steam room cocoon your body. Continue your spa journey by rubbing flakes of ice into your skin, or go outside for an exhilarating dip in the cold plunge pool – taking its cue from traditional Chinese medicine. After your fire and ice experiences, just lie back and drift off in the snooze room. Bedrooms have been individually designed in a contemporary style and feature free Wi-Fi, LCD TVs and work and seating areas. 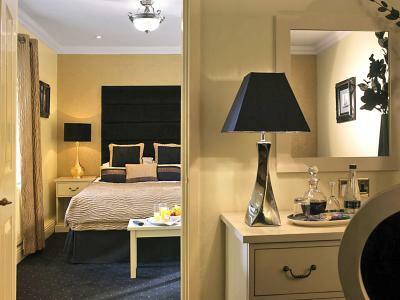 Club rooms, chiefly located on the ground floor, offer additional space and style. These rooms are 200 square feet in size, have custom-made cherry or oak furnishings, and come equipped with DVD players - a complimentary selection of films is available at reception. Room service is available. Wake up inspired. Wake up with Classic British Hotels. Contemporary style en suite bedroom, 190 sqf, offering free Wi-Fi, satellite TV/radio, writing desk, direct dial telephone, ironing station, trouser press, tea and coffee making facilities, toiletries, and hairdryer. Double bed. Contemporary style en suite bedroom, 200 sqf, offering free Wi-Fi, satellite TV/radio, writing desk, direct dial telephone, ironing station, trouser press, tea and coffee making facilities, mineral water, decanter of port, luxury chocolates, toiletries, and hairdryer. King-size bed. Contemporary style studio suite offering free Wi-Fi, satellite TV/radio, DVD player, writing desk, direct dial telephone, ironing station, trouser press, tea and coffee making facilities, mineral water, decanter of port, luxury chocolates, toiletries, and hairdryer. Larger than club rooms. King-size bed. Contemporary style suite offering free Wi-Fi, 2 satellite TVs/radio, DVD player, writing desk, direct dial telephone, ironing station, trouser press, tea and coffee making facilities, mineral water, decanter of port, luxury chocolates, large overhead shower, Jacuzzi bath, toiletries, and hairdryer. Separate sitting room. King-size bed. Take the M1 north to the A1(M). Join the A1(M) and exit at junction 46 for Wetherby Racecourse. Follow the brown signs for the Bridge Hotel. Take the A59 for Harrogate. Just before the A1(M), turn left onto the A168 and follow the brown signs for the Bridge Hotel. The hotel is in Walshford. A courtesy shuttle service to and from Cattal Train Station and Wetherby Coach Station is available between the hours of 8.30am and 6.00pm. York is only 15 minutes away via a direct rail link (pre-booking is essential). Like the rest of the hotel, the Courtyard Restaurant has its own unique character and charm, with oak beams, high ceilings and traditional décor. A member of Yorkshire's regional food group, modern British dishes are freshly prepared using the finest of locally sourced ingredients. Guests can choose to dine from the daily, market or five-course menu. The market menu features mouth-watering carvery and grill options, with tender cuts of meat and the head chef's personally selected locally butchered steaks, matured for 21 days to give a fuller flavour. Start with pan-fried squab pigeon with rocket and durraniam jam. When in Yorkshire, we recommend you try the Whitby fish and chips in Black Sheep batter served with garden peas and homemade tartar sauce. And, to end on a sweet note, finish with vanilla pana cotta with blueberry sorbet and shortbread crumbs. If you’ve got room, choose from the restaurant's delicious selection of Yorkshire cheeses, including Yorkshire Blue, Olde York and Swaledale, fresh from the misty Dales. There are few bars in Yorkshire that can boast 250-year-old oak panelling and an original inglenook fireplace, but the Byron bar is one of them. Guests can savour a drink or light bite in this unique, intimate space. If you're looking for something to share, go for 'Byron bits and bobs,' including a delicious selection of Yorkshire cheeses. A range of burgers, salads, toasted baguettes and 'door stop' sandwiches are featured on the bar menu. After spending the morning stimulating your senses with revitalising fire and ice experiences, treat yourself to a homemade patisserie or a healthy snack from the carefully curated menu in the Courtyard deli. Complimentary iced tea and water is available throughout your visit and served in the Courtyard deli lounge. In the summer, dining at the Bridge Hotel & Spa reveals an altogether different flavour. Take a seat in the fresh open air – sunny or shade – and dine al fresco. The hotel's leafy terrace and fairy-tale gazebo offer an oasis of calm to spend a long summer evening after exploring the local area. Don’t miss the opportunity to indulge in afternoon tea whilst staying in this glorious setting – savour homemade scones with fruit preserve and cream, sandwiches, cakes and a pot of tea. Both traditional afternoon tea and champagne afternoon tea are available to order and can be enjoyed in the Byron Bar - sitting comfortably by the original inglenook fireplace - or on the terrace. Afternoon tea can be booked in advance, at a special price, when booking your room via ClassicBritishHotels.com. The unique surroundings of the Bridge Hotel & Spa present a wonderful setting for private dinners and celebrations. The hotel caters for reunions, anniversaries, family gatherings, birthday parties, charity and club events, and business dinners. Choose from a range of private rooms, each with its own individual character. Call Classic British Hotels on 0844 967 0984 for advice and let us help you organise a memorable private dinner. The Courtyard Spa at the Bridge Hotel offers a tranquil haven in the heart of Yorkshire. Spa guests can relax and recharge with the help of restorative heat and ice experiences - indoors and out. Outside, let your cares drift away in the cedarwood hot tub, soaking up the country views, or take a deep breath and go for a dip in the cold plunge tub. Inside, smother your body in glacial mud from the Austrian alps in the Arabian rhassoul chamber, or experience complete weightlessness in the dry flotation room. After all that exertion, complement your spa journey with a restful retreat - the caramel-toned snooze room, the relaxation balcony or the lavender courtyard. Spa access: access to the Spa is charged at £15.00 per person for 3 hours. Access is complimentary when you book a spa break. Rhassoul/dry flotation: £40.00 per person, per treatment. A full range of spa treatments, using the Natural Spa Factory products, are available to book. The Minster is a world-class masterpiece of stained glass and Gothic architecture, spanning almost 2,000 years of history. Highlights include the Great East Window, the Five Sisters and its newest attraction, ‘Revealing York Minster in the Undercroft,’ a series of interactive underground chambers. Designed by Sir Christopher Wren in the 1690s, behind this Grade I listed country house's magnificent fascade are equally impressive Robert Adam interiors, with Chippendale furniture, Gobelins tapestries and classical statuary. Twenty-five acres of award-winning gardens include impressive herbaceous borders, the National Collection of Cornus and a miniature railway. Recognised as a World Heritage Site, the well preserved monastic ruins of Fountains Abbey transports visitors back to a time when religious life and the world were inseparable. Admire the ponds, statues and follies of Studley Royal Water Garden, picnic on lush green riverside lawns and wander down paths that lead to ancient deer park, where Red, Fallow and Sika deer graze. Ideally located between Leeds and York, a short drive from junction 46 of the A1(M) and 11 miles from the spa town of Harrogate, the Bridge Hotel and Spa offers nine flexible function spaces accommodating all types of meetings and events from 2 to 200 delegates. A courtesy shuttle service is available for delegates travelling between the hotel and Cattal Train Station, Wetherby Coach Station or offices in and around Wetherby. There is free Wi-Fi throughout the hotel and ample free parking on-site. The Ribston suite benefits from a great aspect overlooking the grounds and its own private terrazzo terrace. The Walshford suite benefits from a private reception area, which can also be used as either a break-out or refreshment area, leading out onto the Italian courtyard. The Byron room benefits from Rococo plasterwork, an Italian marble fireplace and an English crystal chandelier.